Do you need CLE credits before the end of the year? 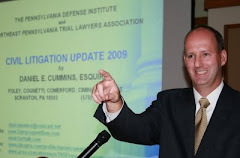 Below is a general listing of upcoming CLE seminars open to all being sponsored in whole or in part by the Pennsylvania Defense Institute across the Commonwealth of Pennsylvania. The PDI will hold a CLE seminar in Philadelphia on November 11, 2013 at the DoubleTree Hotel from 10:30 am to 1:30 pm. The NEPATLA and the PDI have announced a CLE program and Holiday Happy Hour set to take place on November 13, 2013 at the Mohegan Sun Casino at Pocono Downs in Wilkes-Barre. The PDI's final program is in Pittsburgh on December 5, 2013 with more details to follow. Note: For full disclosure purposes, I note that I am a member of both the PDI and the NEPATLA. Also, neither I nor Tort Talk are in any way involved with these events. Rather, I have simply posted this information in response to a request from the PDI to advertise the events here on Tort Talk. In exchange for the advertisements, I have requested a waiver of the attendance fee(s) that would be assessed to me should I attend any of these events.